In this most recent film, Ken once again is inspired by the light, architecture and atmosphere of Venice, this time to paint in oils. We see him painting three views of the Salute, showing the difference in tonal values as the light changes from early morning "contre jour" to late afternoon. He also paints San Giorgio Maggiore, a view looking up the Grand Canal in the evening light and a view of a back canal on a quiet Sunday morning. Venice, by merit of being surrounded by water, has a unique atmosphere and quality of light. It is this, and of course the fabulous architecture, that has constantly drawn Ken Howard back to this city. In his new video, A Vision of Venice in Oils, his theme as he approaches four canal views, is to capture what Monet called the "cushion of atmosphere that's always in nature". 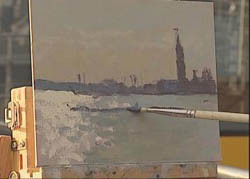 Howard's first painting is a study of San Giorgio Maggiore from across the water. His aim is to reinvigorate a large painting he is working on back at his London studio. He works with a fairly simple, limited palette, concentrating on the relative values he sees in front of him. Starting by slightly overstating the tonal contrasts, he then brings them back together as the painting develops, to reach a harmonious conclusion. The second view is from a location near to the Accademia Bridge, looking towards Santa Maria della Salute. Here Ken chooses to paint the same scene three times, spending about one and a half hours on each. Monet frequently worked in a similar way. He would change his canvas every two hours as the light changed, thereby capturing a scene in a variety of moods. Although he alters the composition slightly as he produces his three versions, Ken has the same intention as Monet, and we can clearly appreciate how, as the sun moves round, the dynamics change almost by the minute. Moving to a back street canal, Howard paints a more domestic view on a quiet Sunday morning to the sound of Venice's wonderful bells. Away from the tourists, he includes local people going to church, completing his painting in just two hours to capture the tonal qualities of the fresh morning light. The final painting sees him return to the Grand Canal, looking up towards the Accademia Bridge. On this occasion the sky is overcast, which provides a more constant light and gives rise to richer colours in the darker passages. With the glowing beauty of Howard's work and such a stunning city, this could only be an inspiring film. The painter's commentary encourages the viewer to work with him in evaluating the balance of colour and tone, as well as to consider the broader issues of composition, observation and the very nature of painting itself. 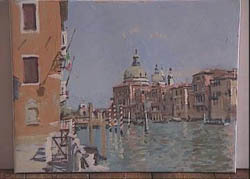 Ken Howard's "A Vision of Venice in Oils" DVD works on three levels. The most fundamental is demonstrating his oil painting techniques, working plein air. Then the setting he's working in will show why so many painters go to Venice. And, lastly, if you've been to Venice it'll remind you of the joys of the city and its potential for paintings. Will make you wish you were going to Venice for your next holiday! I was intrigued to see which scenes Royal Academician Ken Howard would paint in his "A Vision of Venice in Oils" DVD, having been to Venice, seen artists working in various locations in the city, and knowing how many possibilities there are. I wasn't disappointed with his choice: the Salute, San Giorgio Maggiore, a view looking up the Grand Canal in the evening light, and a view of a back canal on a quiet Sunday morning. Howard in fact paints three versions of the Salute, working with the changing light from early morning to late afternoon. It's great to watch him painting, and listen to him talking about what he's doing, as the light is both part of the appeal and difficulty of painting in Venice. One of the many tips Howard shares is how he sometimes tests the tone of a color in another part of the paintng to see if he's got it right. Once you're aware he does this, you'll see him doing it as he's painting. I thoroughly enjoyed the way Howard explains what he's looking at, how he's deciding what to do in the painting, what he thinks is working (or not), how he develops the painting. You really do feel as if you're standing in Venice next to the canal with him, watching over his shoulder as he paints, and listening to him chat. Several recently released videos feature well-known artists painting on location and offer valuable help, instruction and encouragement for would be plein air artists. 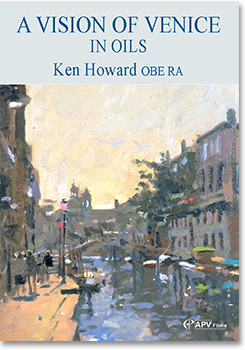 These include a splendid film with Ken Howard A Vision of Venice in Oils, in which there is advice on every aspect of painting outside, from preparing the canvas to understanding and mastering the effects of light. Ken describes Venice as having a "cushion of atmosphere", for its particular quality of light is due to the high amount of moisture in the air. This special kind of light, combined with the wonderful architecture and unique character of the city, has attracted him to Venice for over 30 years. He paints three views of the Salute, beginning with a small, quick 'one-wet' painting and progressing to larger canvases, these showing the difference in tonal values as the light changes from early morning contre-jour to late afternoon. Encouraging us to "paint what you see, not what you know is there", he also completes a wonderfully evocative study of a view towards the Accademia Bridge in the evening light and a painting of one of the less well-known canals on a quiet Sunday morning. Back in his London studio he reflects on this body of work in relation to a large canvas he is painting for exhibition at the Royal Academy.